I watched The Godfather on BBC America, while my wife watched the Grammys on CBS. I don't watch the Grammys for two reasons. 1. The music passed me by a long time ago. 2. Although I like to watch awards shows to see what women are wearing, I skip the Grammys because the outfits are so over the top that a transvestite wouldn't be seen dead wearing them. My wife alerted me when Diana Ross came on. She looked amazing, but she disappointed me by not singing "Baby Love" or one of the other Supremes' hit singles that I lip-synced to when I was a teenager hoping to become the fourth Supreme. 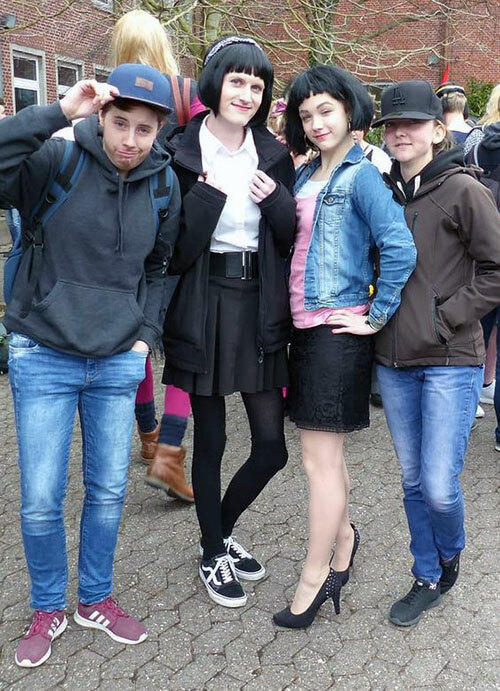 Students crossdressing on "gender switch day." Guess which one may not be a civilian. Definitely the one in the jeans jacket! YUP! Someone is just 'loving it' too much, and his mommy and/or slightly older sister planned and assisted.....I love her heels, and the pose. Definitely NOT her 'last rodeo'. V.
I like her heels and pose, too!